HomeResourcesThe Glass Ceiling is a Real Issue, but the 'Velcro Floor' Could be Just as Bad. Here's How We Can Help. The Glass Ceiling is a Real Issue, but the 'Velcro Floor' Could be Just as Bad. Here's How We Can Help. We all know what the glass ceiling is and how it affects women in the workplace. Let me introduce you to the concept of the Velcro floor–and tell you one way leaders can help women pull away from it, starting now. “Women in the Workplace,” a study by McKinsey, found that, although 57 percent of recent college graduates are women, they are hired into entry-level jobs at lower rates compared to the other 43 percent (aka “men”). And once they get the job, women are just as interested in being promoted as men, and they ask for promotions at comparable rates. But they are not given equitable chances to move up. Many of us have come to think of gender discrimination as something that happens to women in middle management who, for some reason, can’t quite make it up into the executive ranks. The “glass ceiling,” as it’s often called, is certainly real, but the problem is much more insidious than that, this study says. Before they even get anywhere near the glass ceiling, many women are stuck on the bottom; let’s call it the Velcro floor. Think about that for a minute. Picture an enthusiastic and ambitious young woman coming in to your business at the entry level and realizing almost right out of the gate that she’s being undervalued by the higher-ups. What do you think her confidence is like by the time her first big chance for promotion comes along? And if that job goes to a less qualified male…well…you see how this can become a vicious cycle of lower confidence and fewer opportunities as time goes on. Why are businesses hiring well-qualified female employees but undervaluing and under-promoting them? It comes from a subtle but mind-blowing, widespread bias. And it’s something we need to fix right now. 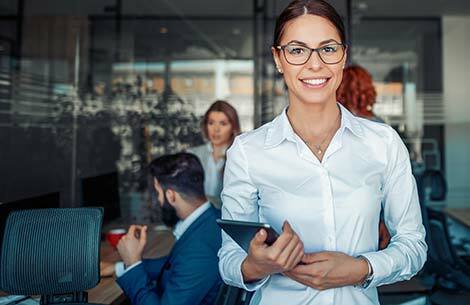 According to McKinsey’s study, if entry-level women and entry-level men were promoted at the same rate, “The number of women at the senior vice president and C-suite levels would more than double.” That is the one thing leaders can–and should–do: give every woman in your workplace a real opportunity to move up as early in her career as you can. If you think that the women in your company are not as ready as the men to get that promotion, then, to be blunt, that’s on you. It means that you’re focusing more development attention on the men. So, from day one on the job, make it your business to offer equal mentoring time, equal training opportunities, and equal project chances to women and men. To be clear, when I say “you,” I mean “you, the boss.” Ironically, perhaps, women bosses also need to be aware of their biases towards other women. Toward that end, I highly recommend that you encourage the more accomplished and experienced senior-level women in your company to be role models, mentors, and sources of encouragement for entry-level women. This all begins with your conscious awareness of the bias and your intent to overcome it. So, from the first day your new employee walks through the door, make it your top priority to get her ready for that first step up the proverbial ladder. Give her an equal chance at every promotion opportunity. Be a mentor. Connect her with other mentors. Learn about her aspirations and Include her in your plans for her career path. Then have a look at your office floor and rip up every bit of Velcro you can find.